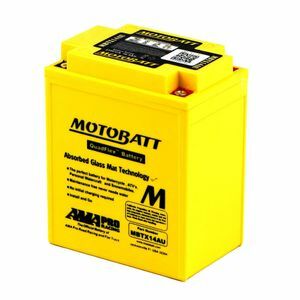 Recently replaced the stock battery with Motobatt mbtx14au ATM 16ah battery,this has the benefit of higher cranking capacity than the one it replaced,so now spins over much faster and is less prone to kick back when staring ,which is what destroys the dreaded sprag clutch . Would recommend this product. I have always been impressed when I've used these batteries in the past. If my motorbikes was left for any length of time with the standard lead /acid one, there would be little charge in it. However these GLM keep a good percentage of the initial charge over a long period. Mine was bought & collected from Tayna of Abergele. So many carriers refuse to transport batteries, so should a fault arise I can return it myself to Tayna. Unlike the standard warranty(if there is one for batteries,beyond 30 days return) these batteries have a full 2 year guarantee.